Procera Music Fiji managing director Mohammed Akif (left), with some local artist at the Procera Office in Toorak. 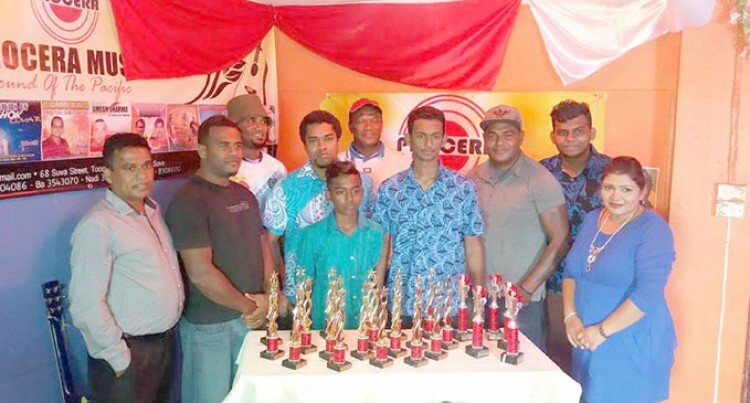 Procera Music Fiji Awards Night will be held tomorrow at the Holiday Inn in Suva. Procera managing director Mohammed Akif said the awards night was to recognise our local music artists. “This is the seventh year we have been running this event in conjunction with Fiji Broadcasting Corporation (FBC), it’s an annual event for us,” he said. The awards will be held on a Sunday because most of our local artists were busy during Friday and Saturday, singing, Mr Akif said. The event starts at at 6pm and it is expected to end at 10pm. Most of the local artists are still based in Fiji; some have moved overseas, while some have died. Procera Music is one of the largest recording companies in Fiji and they only do original CDS/DVDs. They record both iTaukei and Hindi songs. “We have wide range available from Fijian music such as Gospel, reggae, etc and Indian music such as Bhajans, Kirtans, etc,” Mr Akif said. Procera Music Fiji has promoted our local Fiji artist worldwide. Procera Music first started in 1974.